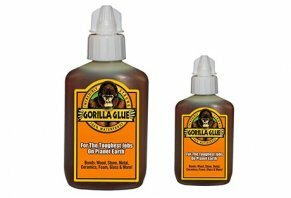 This glue is all hype and no good for gluing rubber to rubber and it's not waterproof. Also very messy and over priced. Gorilla? More like a chihuahua. Absolutely hopeless product. Takes an eternity to set and simply isn't strong enough to hold the lightest of items. Please don't waste your time (like I did) with this rubbish. Total rip-off. I bought it yesterday and wanted to glue the simplest of things, I glued it last night. I got up this morning and it just came apart! What a load of rubbish, and it cost me a fiver, it was the worst fiver I ever spent. I'll have to go get some super glue now because at least I know that will work.